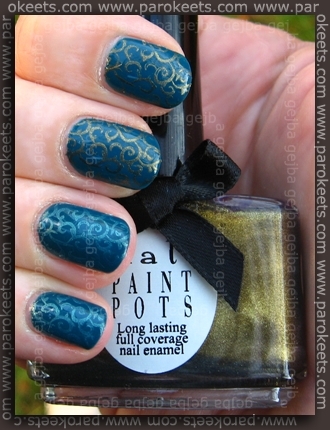 KOTD: Essence Meet You In Budapest + Ciate Golden Globe + p2 So Cool! If you like mine (no. 18) or Meastra’s (no. 21) winter manicure you can vote for us at Winter Nail Art Contest. Every vote is appreciated. Thriszha asked me if I could do konadicure with middle all over image on Chez-Delaney plate H 22. I used Essence Meet You In Budapest for base since that is one of my favorite polishes right now. :D Our Meastra gave me this beautiful polish for my birthday. It’s called Ciate Golden Globe. At the same time I got p2 So Cool! polish from Germany so I had to test both of them. I used Golden Globe with middle all over image from H 22 plate on index and middle finger and So Cool! on ring and baby finger. Which color do you think works better with Meet You In Budapest polish – Golden Globe or So Cool!? They are both pretty nice, i’d love to wear both of them…BUT. They both look very pretty but I agree with Cali369 I also prefer the one with So Cool. I can’t wait to see a swatch of Golden Globes though ;) Iv’ just bought a truckload of plates from Delaney, can’t wait to receive them! By the way could Meastra tell us what shop she bought those Ciate polishes from? Let us know how you like CD plates.